Coach Chuck a.k.a. BAMF (Bald A.M.F.! ), a nickname imparted to him by Coach Slayer because he regularly smokes Slayer out of the water at races, was introduced to triathlons in the late 1990’s and has been a part of the sport, both as a participant and spectator ever since. Coach Chuck is a USAT Level 2 Endurance Coach and ASCA Level 1 Swimming coach. 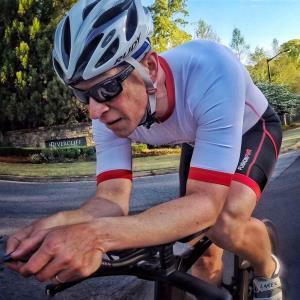 Chuck is a two-time USAT National qualifier and multiple Half Ironman finisher, and 2x Ironman Arizona finisher with podiums at the Sprint, Olympic, and Half Iron distances. He comes to us having mentored many and professionally coached over 10 athletes to successful Ironman and Half Ironman distance events, as well as uncountable Sprint and Olympic distance races. Coach Chuck’s knowledge and philosophies of the sport are ever developing. His approach to coaching is evolving. Like his TCGA coaching counterparts, he is not someone who always follows the mainstream, but rather focuses on the individual athlete and their personal needs while maintaining patience, consistency, and communication throughout the relationship. Balance between family, work, and sport are paramount to the success of each of his athletes. Coach Chuck believes in steady progress and injury avoidance. He wants athletes to enjoy the sport of triathlon and be a part of it for the long haul. Success. Coach Charles Sims has been notified of your message.